Yeah! Innumerable times. Right? At numerous food and beverage outlets, airports, malls and gas pumps, and several other places. But let’s focus on the hotel industry here. What if I talk about hotel guest self-service portal? So this is not a hidden concept, but finally picking up the trend in the industry here. I am speaking what I’ve observed. An increasing number of travelers are using smartphone [guest portal] and self-service kiosks for a quick check-in at hotels. You see…. the trend is extending from fast food outlets to hotel check-in. Out of more than 7.6 billion people on the globe, the mobile users consist of ⅔ of the total population. The fact is, your guests can be many of the above mentioned mobile users. Now the question arises, why should you offer a guest self-service portal? And it increases your engagement, gives a personal touch and more. Well, the guest self-service portal plays a vital role in boosting the relationship between you and your guest. How does this guest self-service portal work, you ask? So, when your guests have booked their stay at your hotel, an automated booking confirmation email or SMS with a link to the guest self-service portal is sent. Once your guest clicks on the link, he is redirected to the portal login. Once done, he can request for amenities and services available at your hotel and more. Right from when your guest books with you till the departing from your hotel, the guest self-service portal is a constant and helps him throughout his stay. Pre-arrival activities like arranging the room, and setting up the favorite requests which came up through the guest portal can be done well-in-advance. This way you can attract the tech-savvy guests and delight them with quick hotel services using the hotel PMS. Usually, when any of your guests arrive at your hotel, they’ve to go through a lengthy check-in process at the front desk, enter the guest details in a guest registration card and then hand over the keycard. Replacing the traditional methods, self-check-in is swift and does not require your guest to wait in the queue. He just needs to be guided to the room as all the process of registration has already been done via the guest portal. Your guests have requested few services pre-arrival. Now it’s time for going on a tour or sightseeing or visit to the museum, your guest can request a vehicle. Likewise, they can opt for other hotel services and amenities at their convenience and extend the stay nights too. Self-service guest portal simplifies the task of guest as well as the hotel staff. Ample of guest requests can be processed via the portal and executed. This way the staff which used to serve the guests in many tasks can now be eliminated. This way you can divert the staff for important works that enhance the guest experience and reduce the cost of hiring extra staff. Whether to extend the stay or cancel the bookings, your guest can request the same with just a click. Also, they can request a change in bookings, like adding guests or request for group bookings too. The portal updates your hotel staff regarding the modification in real-time allowing you and your staff to take immediate action on all the guest requests. You can provide directions to your hotel from the airport, railway station and help guests locate your property easily. The maps, details about nearby attractions to help guests explore the city and the locality in particular. This way whenever your guest has lost the track or is not able to find the hotel address while going out for sightseeing, from the guest portal easily. All has gone well with the guest at your hotel and your guest is pleased with your services. The critical hour begins at the final check-out. Using the self-service guest portal your guest is well aware of all the charges incurred and services acquired. All updates in the guest portal allow him to keep a track of his bill. This way any delusions at the time of check-out are eliminated and your guest is ready for the payment. And, your guest finally leaves your hotel with a smile. Once your guest has checked out, you can request them to review. It is one of the most important features in the portal which allows the guest to give their stay feedback. The reviews help you to improve the services or any suggestions that can be initiated at your hotel. If there is a negative review, answer it in a way that solves the issue. Even this reply will be helpful for you in taking care so that it doesn’t happen anytime in future. So, as soon as your guest has received the link, he can feed personal details and create a profile in the guest self-service portal. This way few preferences are mentioned in the portal which automatically gets updated with the system. Using this, you can wish birthday or anniversary greetings. He can even mention the meal choices, favorites and send special requests too. On the other hand, the PMS also ensures that the final decision will be yours when it comes to providing services to your guests. All the requests can be approved or rejected only after your confirmation. Thus, giving the complete power to you! In short, self-services are trending among mobile users. It’s a kind of mandatory to keep a similar service at your hotel, and what’s the best way to do this other than this guest portal. 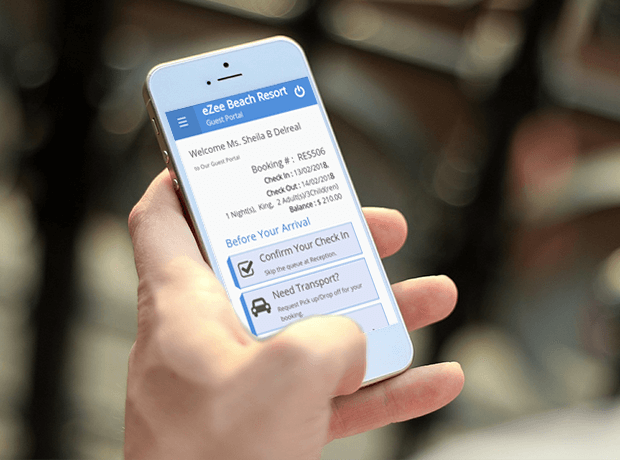 Follow the above tips and simplify your hotel operations, and give a wider scope of engagement to your guests with a mobile guest self-service portal. Snehal leads the support, training and deployment teams at eZee. A tech-savvy person from heart, Snehal is always up for challenges and logical discussions on worldly affairs.